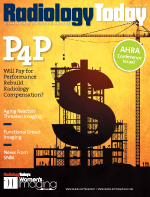 P4P — How Will Pay for Performance Affect Radiology? As Congress looks at ways of reforming healthcare and containing costs, pay-for-performance (P4P) measures are sure to be discussed. Radiology already has seen a few P4P measures, mostly in interventional radiology. Many expect P4P to grow in radiology, as it will across medicine. Radiology Today’s Beth W. Orenstein recently asked three leading radiologists to discuss how they believe P4P will affect imaging services and what hospitals and private practices can do to prepare. She spoke with James H. Thrall, MD, FACR, chair of the ACR board and chief of radiology at Massachusetts General Hospital; George A. Fueredi, MD, an interventional radiologist with Aurora Medical Group based in Burlington, Wis., and the Society of Interventional Radiology’s representative to the American Medical Association on this issue; and Eliot L. Siegel, MD, FSIIM, a professor and the vice chair of radiology at the University of Maryland School of Medicine and the chief of radiology and nuclear imaging for the VA Maryland Healthcare System. Siegel is also long active in the Society for Imaging Informatics in Medicine. She asked them the same questions in phone interviews and presents their responses in a panel discussion format. Radiology Today (RT): What P4P indicators are currently used for radiology? Eliot L. Siegel, MD, FSIIM: The performance measures included in the Centers for Medicare & Medicaid Services’ Physician Quality Reporting Initiative for 2009 are carotid imaging reports (measures 10 and 11), recording of fluoroscopy time for procedures during fluoroscopy (measure 145), and inappropriate use of “probably benign assessment category” in BIRADS [Breast Imaging Reporting and Data System] performance (measure 146). Additionally, there are seven measures that may be reported by interventional radiologists, six for radiation oncologists, and one nuclear medicine measure: correlation with existing imaging studies for all patients undergoing bone scintigraphy (measure 147). James H. Thrall, MD, FACR: Beyond that, there are pay-for-performance programs from private insurance companies in some states. In Massachusetts, for example, all of the major private insurances have pay-for-performance measures. These measures are aimed at levels of utilization. The utilization metrics are more challenging for radiologists because radiologists themselves do not control utilization of imaging. RT: Which indicators are likely on the near horizon? Siegel: A number of indicators are being reviewed. They include increased use of appropriateness criteria for imaging low back pain and emergency medicine, appropriate use of osteoporosis imaging, and prostate imaging. I also believe that measures that look at use of technology that promote interoperability and improved access of images and reports to patients and referring physicians may be on the near horizon as well. Others could include callback rates, rates of contrast extravasation, referring physician satisfaction, and repeat rates. Thrall: A whole series are under review by the National Quality Forum. There are indicators such as recall rates for screening mammography. … There are other quality indicators such as the length of time between patients arriving at a hospital and when they undergo certain diagnostic and therapeutic procedures. So, for example, if someone has a suspected stroke, one quality measure is how quickly they go from the street to being in a CT scanner and having a CT scan. George A. Fueredi, MD: It appears there’s going to be a push for determining efficacy of what we do as radiologists. There’s no question about that. Outcomes are going to be very important, and more performance measures that look at outcomes are likely. RT: How can practices prepare themselves for wide-scale P4P? Siegel: They need to become aware of the current measures that are being evaluated. They should educate their members about ongoing efforts in pay for performance. Also, practices should make sure that their information systems vendors are following developments and will be able to facilitate measurement and compliance. This includes speech reporting vendors who can help to design reporting templates that require, or at least encourage, compliance with expectations. It also includes PACS and RIS and EMR vendors who will need to be able to track parameters such as report turnaround times. Practices may have to invest in additional third-party add-on software that will mine multiple information systems for these data. Thrall: Practices are going to need to look at their work processes. They’re going to need to look at their institutions and the infrastructure within the institutions that support the work process. They should look at systems for auditing their work against pay-for-performance objectives before the work is officially completed and sent out in order to ensure the pay-for-performance goals are met. I also think there is a cultural and even psychological aspect. The cultural aspect is being willing to participate in an ever-increasing number of compliance issues. All of medicine has been barraged in the last few years with many, many new compliance issues. Frankly, many of them are common sense, and it’s even a little embarrassing that forces outside of healthcare had to be brought to bear to get physicians and hospitals to comply with them. For example, one of the major compliance issues for The Joint Commission is hand hygiene. Hand hygiene has been known to be important for 150 years, ever since Dr. Ignaz Sammelweis demonstrated in the 1840s that fever in women who had just given birth was caused by bacteria being carried from one new mother to another by their doctors. Yet here we are in the 21st century arguing about whether every doctor should have to wash his hands before and after every patient encounter. So there is a cultural transformation that has to take place, quite honestly. Many doctors are resistant to having other people dictate to them what they should do. Another example is the universal protocol or timeout before interventional and surgical procedures. In the past, the team doing the surgery or interventional procedure would typically come into the procedure room and go ahead with whatever they were going to do for the patient. Today, the entire team is required to stop what they’re doing and then everyone on the team from least important to the most important person must agree that the patient is the correct patient, that the location of the procedure is correct, and that all other details are correct before the procedure can be undertaken. Many physicians find this to be obtrusive. Yet every year, we know there are dozens, if not hundreds, of patients who suffer because they are the wrong patient and a procedure shouldn’t have been done at all, or the procedure was done on the wrong side or part of the body. RT: What type of data should practices be tracking? Siegel: They should be tracking compliance with reporting templates for the current and soon-to-be-released performance measures. They should be tracking and using dashboards and other tools to evaluate things such as repeat rates, contrast extravasation, patient and clinician feedback on satisfaction, turnaround times, patient arrival and departure times, and peer review and follow-up data. Fueredi: Practices should be tracking outcomes. They should be tracking complications of interventional procedures and the outcomes of them. The ACR has developed a peer review program called RADPEER that is Web based. It’s a very good program. Radiology practices should be looking at it. RT: How can radiology reports be reengineered to better reflect P4P indicators? Thrall: Radiology reports have largely been free text in the past. But now with voice recognition systems, it’s possible to prepare templates and macros for any particular procedure that we do in radiology. When it comes to P4P, it’s possible to build in the alerts and actually the compliance language, prospectively. This has the advantage that a radiologist doesn’t have to remember all of the P4P indicators, as he or she will be automatically reminded when the reporting template comes up on the monitor. Siegel: Templates are already being created by an RSNA structured reporting initiative. Vendors and others will need to ensure that templates can request the requisite information from radiologists during reporting. Additionally, reporting vendors such as speech recognition companies need to have ways to track and monitor compliance with the use of these templates. RT: How will practices’ IT workflow need to change in order to efficiently collect P4P data? Thrall: IT will play a very important role in officially responding to P4P. It’s all about compliance, and it’s all about knowing which cases require certain special consideration. No one will be able to remember this off the top of his or her head during a busy workday, so it will be vital that the IT systems help the radiologist with the compliance issues. Having that built in is a great investment for a department to make in its infrastructure. It is important to spend the time—and it’s mostly time—to build in the alerts and the macros into voice recognition or speech recognition reporting systems. Siegel: There will be a need for better collection of information that cuts across multiple information systems. For example, you may need to collect information that can answer the time it took from when a patient arrives until a report is available to her or his clinician. Workflow will need to facilitate flexible and rapid data mining without adversely impacting system performance. The systems should move to a model of real-time performance evaluation rather than retrospective reporting. Fueredi: You have to have dedicated support staff and dedicated physicians to handle large volumes of quality data and to direct the management of quality. What kinds of measures are you going to look at? What kinds of projects are you going to have? It will mean educating the IT folks in the same way we had to educate them with regard to PACS. RT: What investments can practices make to their IT infrastructure that will produce the best results for P4P indicators? Siegel: First, practices need to move to electronic environments and eliminate paper data collection and storage whenever possible. They need to ensure compatibility with software that allows data extraction, and they need to be able to interoperate with other software. This may require new upgrades, switching to new systems with associated migration of data to new software, or the acquisition of additional software that can track or mine data that is already within those systems. Fueredi: Not only must you have a very good way of collecting data and being able to mine the data, but you also must invest in people both on the technical and on the professional side. You need physician leaders who are interested in quality and who understand what questions to ask and what measures you want to track. You need the technical staff that can help you frame the right questions and who understand how to mine the data. They have to have an internal mechanism for evaluating the quality of physicians and of technical staff. You have to have some kind of mechanism to improve practices and effect change. RT: How soon is P4P likely to become widespread? Fueredi: I think it is already widespread. The quest for outcome data and the need to have a handle on quality are all around us. The debate is going to be how quickly we’re going to tie your performance to your compensation. I don’t have any idea on that. President Obama says he wants to reform healthcare this year. I don’t know whether there is the ability within the federal government to do all this so quickly. But I think within the next three to five years, it will be very prevalent. Thrall: In a sense, it is widespread now because Medicare has decided to push the concept. It’s certainly widespread in Massachusetts. We not only have P4P on radiology utilization, but we also have indicators for utilization of hospital days, drug utilization, quality indicators for treatment of diabetics, treatment of asthmatics, and so on. So it’s touching a lot of patients now already across the country. The corollary question is not when it will be widespread but when will the economic implications of it become a dominant factor in reimbursement to hospitals and doctors. That’s less clear to me. The irony, in a way, comes from another Medicare program. Medicare created a P4P pilot project around cardiovascular disease, where hospitals meeting criteria would get up to a 2% incentive payment. By the same token, hospitals at the bottom that were not meeting the criteria would have a penalty. This raises the interesting conundrum of the rich getting richer and poor getting poorer. Does it make sense to take money away from a poor-performing hospital that may need those resources to, in fact, improve its performance? And is there a risk we could get into a cycle where successful hospitals and physician practices use the money they are getting to further improve their systems and become even more competitive at the expense of the lower performing hospitals and practices? We would create a tiered medical system with different levels of quality. I think that really illustrates the general problem of trying to reengineer social systems like the healthcare system. What at the first instance may appear to be a terrific idea can have unintended and even unrecognized consequences. We don’t know fully yet what those will be with pay for performance. Siegel: I believe that substantial “healthcare reform efforts” in the next several months or years will accelerate the trend toward having a greater percentage of salary that is based on “performance.” The biggest challenge is going to be how to apply this in the radiology domain. It’s more straightforward and will likely happen earlier for family practice/primary care. Determining how to best create performance incentives that work well in diagnostic radiology for radiologists will be more challenging and will occur subsequent to more widespread application of pay for performance in medicine in general.